I’m taking a small break from my free writing story The Experiment today. Heard the song in the video below on the radio today (no, not the first time, but it always speaks to me when I do hear it). Just want to apologize for any advertisement that might come up before the video starts (or even if they come up while the video plays – as this is from youtube and I have no control over those things). Nearly ten years ago, my baby girl entered this world a little too eagerly. She was born ten weeks early and under a lot of stress. She spent the next five weeks in the Neonatal Intensive Care Unit (NICU). On day seven, she had an ultrasound taken of her head. Standard practice for any child born so early, they told us. They found something. At some point between my wife’s last ultrasound at 28 weeks of pregnancy and our daughter’s birth at 30 weeks, my little girl had a brain bleed. The scar tissue now clogged one of the ventricles in her brain. It’s called Hydrocephalus. Water on the Brain. Not something on my radar before this, I wasn’t prepared. But the hospital was. One of the pioneering women in Neurosurgery had recently come out of retirement and was working at my daughter’s hospital. Imagine that. I’m speeding things up, but she received two brain surgeries by the time she was seven weeks old. The second one put a shunt in her brain to help drain the fluid. I’ve shared before in this post that she had one more just after she turned two years old. Today, well today I look at her and keep wanting her to stop growing up. She’s a vibrant, happy, intelligent, imaginative, incredible nine year old – nearly ten she reminds me often – girl who has the world to conquer. If you knew her, you’d have no doubt that she will conquer it. Probably without breaking a sweat. Why do I tell you this? What has this to do with “The least of these”? My daughter is alive and who she is today because of many things. She was born in a time and place that provided all the medical necessities she would need. She was born into a family and into a country where she would not have to know what poverty really was. She would not have to know what it means to go without food, shelter, sanitation, safety. She was surrounded by people who loved her and had means to give her beyond her basic needs. My son has that, too. He is a miracle as well. But, I want you to focus on something here. Not every child gets this kind of story. In fact, most children in the world do not get a story remotely like this. Not the medical care. Not the assurance of food and shelter. And sadly, not the knowledge that they are safe. The thing is, every one of those children, every human being, was created in the image of God the same as my children. There is no special reason for them to suffer and my children to not suffer. I believe in God’s grace. I believe that He has provided for me and for my family. I believe that He watches over us, protects us, loves us. I don’t have the answers for God’s blessings on some and not on others. There are many theological ideals we could explore, but that’s beyond the scope here. I have a Master’s degree in Apologetics. My thesis was on God and Evil. I know this: God is real, God is sovereign, God is love, God is good. I also know that we live in a world that became cursed when man decided they wanted to be God instead of be with God. Again, we could discuss this, but that’s beyond the scope here. We live in a cursed world, but God has not left us to fight on our own. However, He has made us – you and I – as His main weapon against the evil in this world. Evil is not a thing. It is not some entity that battles for supremacy. Evil is the lack of good. Just like cold is the lack of heat. When God made us in His image, He made us capable of good. He gave us the choice to choose good or evil. That means a lot. A lot for what we can and can’t do in this world. One person can’t change this world. Not all of it all at once. However, each person can change their sphere of influence. They can make the difference between good and evil. Imagine what would happen if lots of people got together and purposefully did that. Changed things around them for good. One act at a time. One life at a time. What could happen? What are the possibilities? Children all around the world might have those assurances of food, shelter, medical care, love, safety? Impossible? No. Nothing is impossible. Unless we choose not to make those changes. It doesn’t have to be impossible. It doesn’t have to be overwhelming. One act. One person. At a time. It can happen. 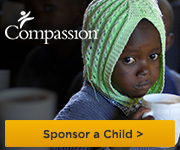 And yes, Compassion International is a great place to start. They’re a bunch of people that got together, and they’ve started making some incredible differences. International Justice Mission is another. And there are more. A lot more. I just happen to be a big fan of these two. But there are no limits. No limits to love. Love the least of these. ~Remember, this is a copyrighted creation. See my notice in the sidebar. I would love to hear your thoughts on this story in the comments below and on Facebook. ~ Want to know more about this story or other stories? Keep up to date via my Newsletter. Click over on the side or from the Menu at the top of the page. Previous postThe Experiment Part 10: Am I Going Crazy? Very touching. I am so happy your daughter is doing well. I will also pass this information on to my group. Thank you. So absolutely true yet sad at the same time. People say life is unfair to everyone and that is why it makes life fair. But I don’t believe in it. A poor father works day and night tirelessly to feed his family yet he is burdened by those corrupt and ignorant. It’s honestly a very sad thing.. It is. That’s why I like the guy who started IJM – he has a book called the Locust Effect. I shared his TED talk about it a little while ago. It’s basically why a lot of the money we give to end poverty isn’t having the impact we thought it would. It’s because of the violence and the lack of safety in poverty. Ohkay.. I’ll definitely give the video a watch.